All transactions are safe and secure with a reliable history in online purchasing behind each of our associates. 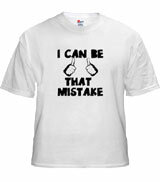 Buy the I Can Be that Mistake Superbad t-shirt to own Superbad clothing and merchandise. The design on this tee eludes to Seth's funny Superbad quote, "You know when you hear girls say 'Ah man, I was so sh*t-faced last night, I shouldn't have f**ked that guy?' We could be that mistake!" The front of this light blue McLovin Superbad t-shirt displays the quote in black text, with an image of two thumbs pointing back at the wearer. Seth delivers this line when he's talking to Evan outside during Evan's gym class. In addition to the I Can Be that Mistake Superbad tee above, browse the Superbad Clothing Gallery for more apparel like men's and women's clothes, kids shirts or hoodies.